I agree on most all points with Sam on this. I do disagree that Randall stamped Astros weren't made until 1963 or later. It is apparent the 7 that went to the Astronauts were, and we know a replacement went to one of them. 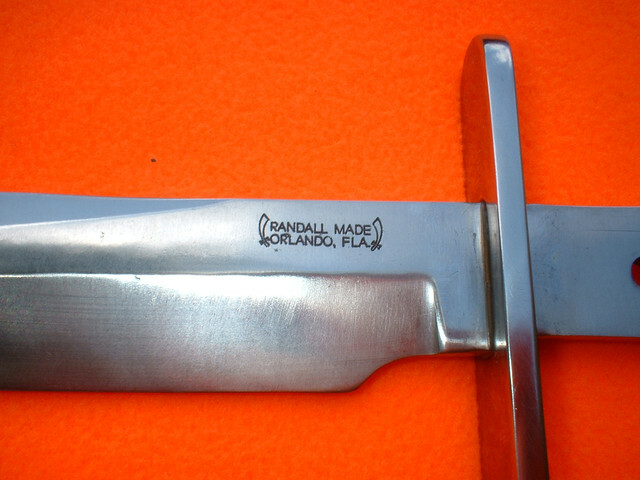 Randall does not forge an exact number of blades, particularly one of such importance. So, there was some number more Orlando blades available for use other than the 7(8) original order. To say that an Astro sans scales is a "kit knife" is inaccurate and questionable at face value. I have a very early Astro Sam has examined that came from the original owner that is purported to have been without scales as the family member remember it since acquisition. There is a back story to this that is may have been gifted to the owner by Shepard himself, as they were friends in some capacity. I cannot at this time prove it beyond a doubt, but if the family ever lets go of some of the supporting docs they have, it may come to fruition. That being said, this is only the second Astro I recall coming in a double brown button Maurice Johnson sheath. Obviously one of the earliest available to the "public", and if actually a gift from Shepard, most certainly one of if not the earliest in the hands of someone as far as I know was outside of direct involvement in the space program. Again,if the family releases the documents, that may be proven otherwise. Randall book by Bob Gaddis, page 187. It appears that Bo sent a second Astro to the Smithsonian for display in 1961 without scales. We have photos of the one with brown Micarta, but I have not seen the second Scaleless Astro. Has anyone been to the Air & Space museum in the past to see it? For the past few years the Freedom 7 (Alan Shepard's) capsule has been at the JFK museum in Boston Ma. Don't know if the knife is still part of the display, or in storage, or if the museum disposed of the knife. Last edited by samg; 03-15-2019 at 08:22 AM. 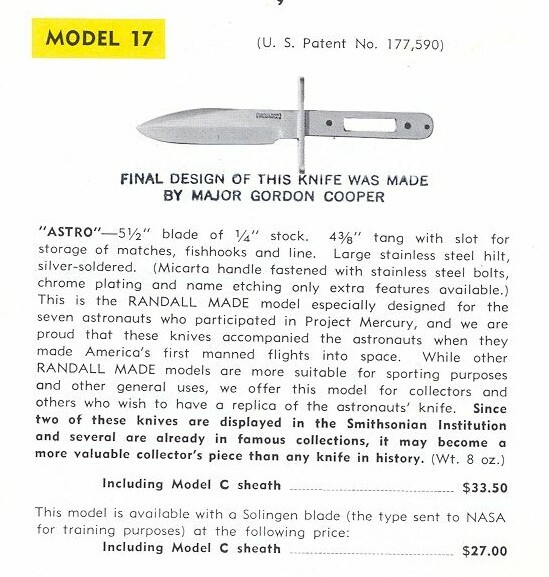 On page 186 in Gaddis' Randall Made Knives book, we see a letter from the Air & Space Curator Kenneth Newland referring to the 2nd Astro made as a replica for the museum, made as a "more accurate display." Referring to the Scaleless Astro which was displayed in the capsule itself, and the other Micarta Astro being displayed to illustrate the workmanship of the knife. Below is John Glenn's Astro, also on display at the Smithsonian. I have sent a request for information from the Smithsonian. It will take a few weeks for them to respond. It appears that Bo sent 2 Astros to the museum, one with scales, one without, and the 3rd is from John Glenn. I do not know the status of these knives, whether they are still displayed or in storage, or disposed of. Hopefully I will find out the status. I heard back from the curator for Mercury spacecraft and components at the Smithsonian museum. My original query about the status of the Randall knives at the Smithsonian. You can see that I thought that the Smithsonian had 3 Astros, as one is online as coming from John Glenn. Mr Neufeld clears that up in the following emails. I am researching a knife that was gifted to the Smithsonian Air and Space Museum in August 1961. 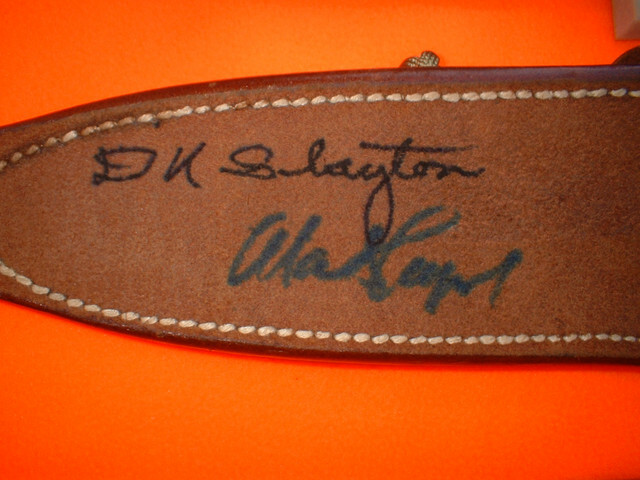 .The knife of interest was a replica of the actual survival knife made for the Mercury Astronauts. I know of 2 Randall knives on display, one flown by John Glenn, and the other one with the Freedom 7 display from Alan Shepard's Mercury flight of May 5, 1961. I have photos of both of those knives. 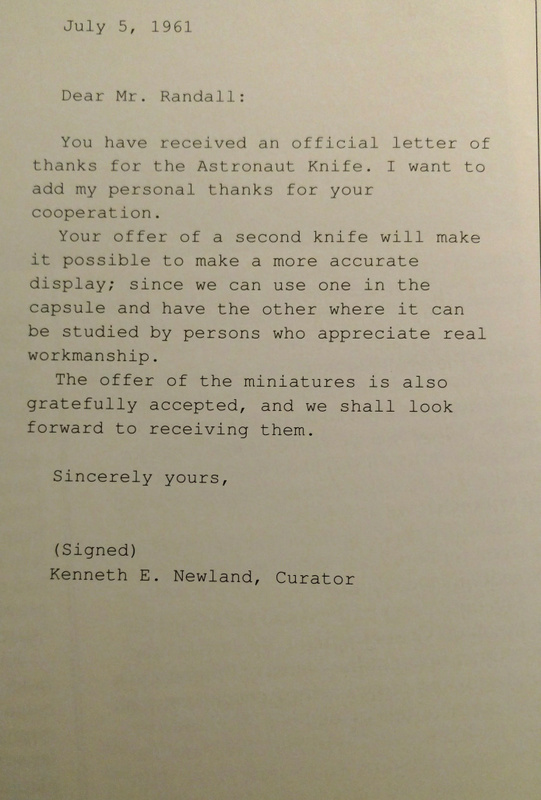 The one of interest to me is a Randall knife, made for display with the Freedom 7 capsule that was gifted to the museum's then Curator Mr Kenneth Newland by Mr Bo Randall in August 1961. Mr Randall suggested that the knife be displayed with survival items in the handle cavity cutout. Whereas the other 2 Randall knives that I described above have brown Micarta handles bolted onto the tang of the knife, this 3rd knife was displayed in the Freedom 7 capsule without the brown bolted on Micarta handle. It was displayed with survival materials in the bare metal handle. If you have a photo of this knife, I would appreciate a copy of it. Im not sure of the status of the original Freedom 7 capsule display or it's location, but would appreciate information about it's location so I can plan on a visit to see it. It seems that Mr Newland in 1961 planned to display this knife in the capsule. Dear Sam: I am the curator for Mercury spacecraft and components. We actually have only one knife, the replica you mention of the one carried by Shepard. It has an accession number of A19620001000. 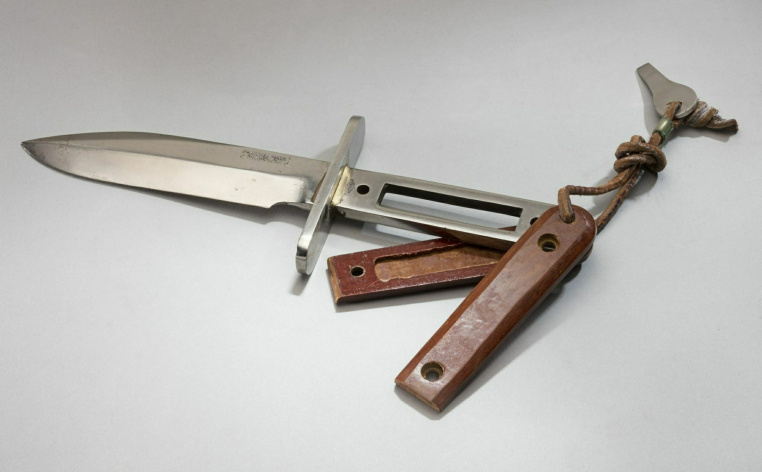 It was once mistakenly reaccessioned as John Glenn's survival knife. Some years ago I found that it was the same one and I had the duplicate number deaccessioned. The Freedom 7 capsule is currently on exhibit at the John F. Kennedy Library in Boston, and will return here at the end of 2019, probably. It will be exhibited in our new Destination Moon gallery beginning in 2022. But the hatch was reportedly lost at sea during the recovery process. We never got it. I believe that is why Mr. Randall gave us a duplicate. I hope that helps. Your attachment didn't come through to me, in case you want to send it directly. Hello Mr Neufeld. Thanks so much for your reply. The knife you are referring to, accession number A19620001000 is the same knife in both online photos? 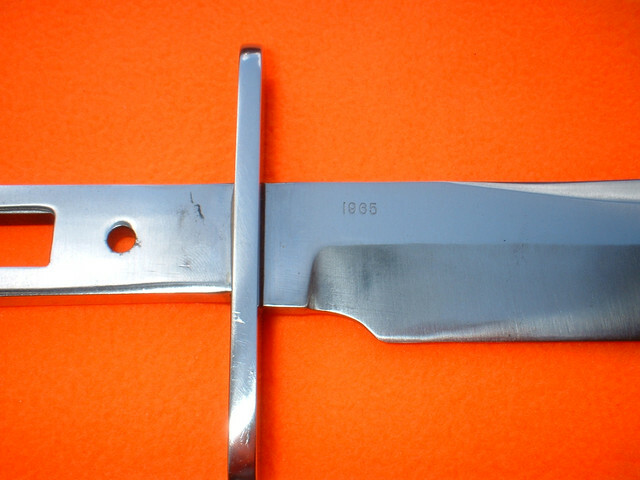 One photo shows it with the handle opened, displaying the tang, the other photo shows it completely assembled. See photo. How is it displayed now? The other photo is of the letter from the Curator at the time Mr. Newland who indicated that one of the 2 Astros would be displayed in Alan Shepard's capsule. The other was to be displayed to demonstrate the workmanship. The other photo is of other discussion of the 2nd Astro. Both Astro knives were sent to Mr. Newland. One with scales, obviously the one you have on display, and another without scales to be displayed in Alan Shepard's capsule. Is one of the Astros on display in the original capsule? Thank you again Mr Neufeld for researching and providing me with information on these knives. Hi Mr Neufeld, I neglected in my earlier email to you today to respond to your statement about the hatch on Freedom 7. Yes it was lost when Alan Shepard blew the hatch. It was secured to the inside of the hatch. A number of years ago Gus Grissoms Astro was recovered, after spending several decades at the bottom of the ocean. It was found inside the capsule. According to Grissoms account, he removed it from the hatch, as he anticipated leaving with it, but when his capsule began taking on water, his survival instincts took over and he dropped his Astro inside of the capsule. Both suborbital flights had the knife fastened to the inside of the hatch. Starting with John Glenns orbital flight, they were from then on fastened to the survival kit. Thanks for the information. Yes it is the same knife. I don’t know why the handle is loose in the more recent photo. Maybe the rivets/screws became loose. Maybe the earlier photo was staged. Liberty Bell is at Kansas Cosmosphere if you want to ask them about that knife. 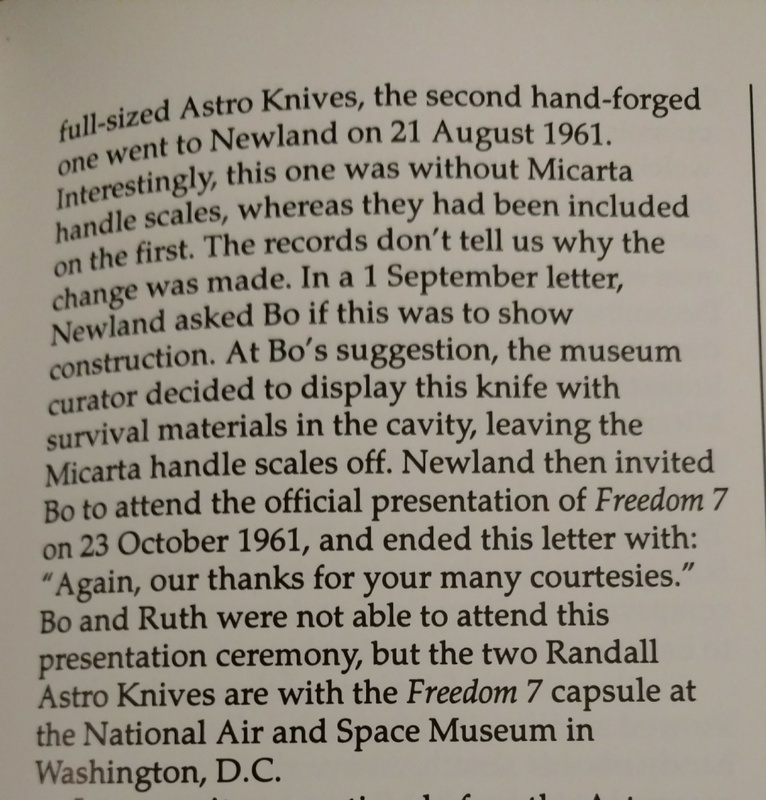 Do you have any knowledge of the 2nd Astro without the scales/handle that was displayed inside the original Freedom 7 capsule, as referenced in the 1961 letter from the then Curator Mr Newland to Bo Randall in the attachment that I sent you? That was quite a story about Gus Grissoms knife being recovered after being submerged in salt water for 30+ years. No. I’m not aware of a second knife. We only accessioned the one. It is possible it was a loan at the time. If that 2nd knife was placed inside of Freedom 7 as part of the permanent display with the capsule, would it be part of an inventory that you would have record of? It’s not inside the spacecraft. We don’t have another unless they are in the survival kits from later missions. So that's it. It seems that the 2nd Astro that was sent to the Smithsonian has disappeared into the dustbin of time. Here is a Scaleless Astro that Tom Dehart offered me a number of years ago. No idea where this one is today. I do not believe that knife and sheath are original to each other. I agree Joe, it's definitely a later sheath. It is possible that this Astro was ordered without a sheath and paired up with one later, as the only thing these Scaleless Astros were made for, was to display...as intended, for collectors. Bo even states so in the catalog, that there were Randall models more suitable for sporting purposes. It was at a time when the country was excited about going to the moon. It's interesting that this one is from 1965, when Micarta was standard.